Remember hunting for your first apartment? Usually it was either in a complex constructed in the era of the standard-issue light gray carpet (that would be the past half century) or in a multi-flat building considerably older with the obligatory oak wood flooring. And man, that oak was worn! Now that you're pondering hardwood flooring for your current home, you may well still be thinking "only oak," and that you'll simply stain it, if needed, to accommodate the room's style and color palette. If you are, then we happily invite you to re-think wood. 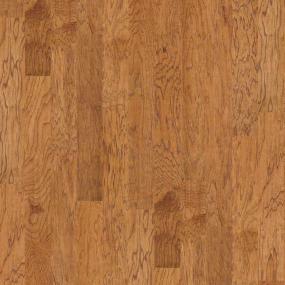 For starters, there are numerous wood flooring species, from acacia to yellow birch. Among all these species are hundreds of styles manufactured by the most respected names in flooring. Oh, if there was ever a need to engage the help of a ProSource Wholesale® flooring expert, that time is now. But before you do, how about a quick homily on hardwood? As we mentioned earlier, oak was the original hardwood floor. And the oak was good – durable, easy to clean, and simple to cover with carpet come the 1960's. But with the emergence of scores of new hardwoods, homeowners had a choice – and in most cases, they decided based on looks alone. Light wood for a casual room such as a kitchen or kids room; dark wood for a more formal setting like a living room or dining room. Simple, right? Yes – but in the long run, not the best way to choose hardwood for a room. Wood is a great choice for flooring – it's a great investment, adds a touch of class to any room, is hard-wearing (with the degree of hardness determining the level of durability), and it's environmentally friendly. Before choosing hardwood flooring based on sheer looks, the choice should be based on the room; or more specifically, how the room is to be used – the amount of traffic; potential exposure to food and drink; susceptibility to moisture, among other factors. And, of course in the end, you'll want to accommodate your room's style and color palette. With minimum traffic and a steady, controlled climate, the bedroom is a great place for a soft, porous, luxurious wood like black walnut or American cherry. Busy place, the kitchen. Lots of people and moving chairs that can scratch the floor. Not to mention heat, moisture, spilled drinks and overflowing sinks. A hardy hardwood like mahogany or hickory is great here. A floor with a rich look, but something that can take a beating – sounds ideal for a family or living room, right? Something in the center of the hardness scale is ideal here, such as maple or oak. Yes, oak! But not that old oak mentioned earlier. 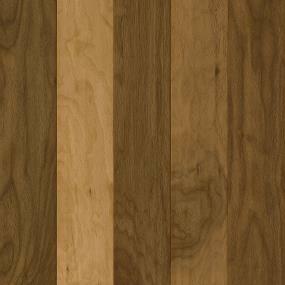 A natural red or white oak would be unique, yet stand up to wear. 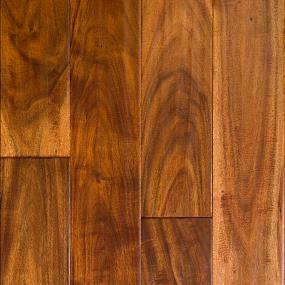 If you plan to install hardwood in multiple, connecting rooms, the same species and color should be used to achieve a uniform, continuous flow. This will also make the overall space appear larger. Then there are the ancillary concerns beyond the room consideration when deciding on the wood species for your new flooring. The first thing that probably comes to mind is kids, right? But believe it or not, they are the least of your concerns. Most quality hardwood can take anything a kid can dish out. But when it comes to pets, watch out! Dogs and cats can shorten the life of a hardwood floor before you can say, "Why did we buy a pet in the first place?" If you're going to have pets inside, harder woods are optimum. And this is even when keeping your pet's nails trimmed. As for messes, immediate cleanup is a must (the softer the wood, the sooner). Sunlight can cause damage on virtually any hardwood, but it's good to know that darker, exotic woods are more susceptible to sun damage than lighter, domestic hardwood. Of course, many people enjoy the tint that sun can add to a hardwood. Just keep an eye on the wood. A dramatic change in tint can occur in as quickly as six months. Natural humidity can certainly affect the look and performance of a hardwood floor. Do you live near an ocean or have a house in the tropics? If so, it may be best to avoid porous hardwoods such as pine or birch. Review the product catalog for hardwood options, and add those you like to your myProSource project center. Obviously, this is a quick review of what can and should be a very detailed exploration and decision-making process. All the more reason to work with a ProSource showroom. Additionally, it's good to remember that laying down hardwood flooring is truly a work of art. So be sure to ask your ProSource rep for a recommendation on a professional contractor for the installation of your new flooring.